Edinburgh Capitals, after a very poor showing in their 10-1 loss to Nottingham Panthers at Murrayfield on Sunday, are back in Elite League action tonight when they make the trip across the Forth to face Fife Flyers. Cash-strapped Capitals have endured a torrid season both on and off the ice and player-coach Michael D’Orazio, who did not play on Sunday due to an equipment issue, will be looking for some sort of reaction from his small squad against the Kirkcaldy outfit. Despite already wrapping up the Gardiner Conference earlier this month, Flyers lost 8-1 to Sheffield Steelers last time out with a team decimated by injuries. Their cause tonight is not helped by influential defenceman Russ Moyer and net-minder Andy Iles picking up knocks, adding to the injury woes of head coach Todd Dutiaume. 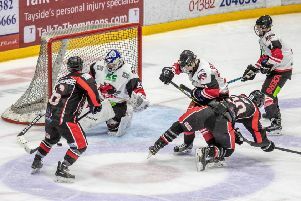 With Capitals’ Canadian goalie Tyler Beskorowany nursing a knee injury, Edinburgh will continue to be backstopped by 18-year-old net-minder Jordan McLaughlin. The teenager enjoyed mixed fortunes last weekend, playing a big part in the Murrayfield under-20’s side reaching the semi-final of the Scottish cup – Saturday’s 4-1 victory over North Ayr Devils enough to secure a home tie with Fife Falcons next month – before making the huge step up to Elite League level against Nottingham the following night.